Review Soflens Daily Disposable I use these lenses while on holiday in warm climates. Find them great for purpose. Review Soflens Daily Disposable Speedy delivery, good price. Recommended! Review Soflens Daily Disposable My eyes get very dry after a few hours of wearing these lenses. While they are much cheaper than other brands, I won't be buying these again. Also their shape is flatter than other brands making it mee difficult to put them in. Sometimes if you blink they fall out! Review Soflens Daily Disposable I find this product to be very reliable. Never really have any trouble with it aside from if I have it in too long, but it is very comfortable most of the time. It is excellent value for money, especially when ordered in bulk. Review Soflens Daily Disposable Really impressed with these lenses. The price point is what drew me to them but they work just as good if not better than more expensive lenses. Review Soflens Daily Disposable I find the daily Bausch&Lomb contact lenses very comfortable. They are also very good value for money. In my day to day life I usually use the extended wear lenses. However, when I travel, I prefer to use the daily option. I'm using the B&L option for the past 8 years and never had any problems with them. Review Soflens Daily Disposable Delighted with product and with efficient delivery. Review Soflens Daily Disposable I only use lense when cycling and use an eye drop before putting them in. Used to have issue of tired/dry eyes after a few hours, but not with these. Can't say for sure if it's lenses or drops that helped with this issue. Review Soflens Daily Disposable a very good comfortable lens even when it is in all day.easy to put in and take out and slight colour in lens also makes it easy to see if you do drop it.I Tried other lenses over my time but this is definately the best. Review Soflens Daily Disposable very happy with the service provided. Review Soflens Daily Disposable I find these lenses suit my eyes. I reacted to the solution in other lenses but the solution in these lenses is much more comfortable. I also like that they are daily disposable s as opposed to monthly ones. They are usually easy to put in and take out of my eyes. Sometimes they are turned upside down when I remove them from the packaging-this makes it very uncomfortable when you put them in. However, I have been using them for so long now, I am usually good at recognising if that is the case. Overall my vision is reasonably good with them . I have a stigma so it's not quite perfect but I can function well with them. Review Soflens Daily Disposable Very comfortable to wear easy to put in I'm very happy with these contacts. 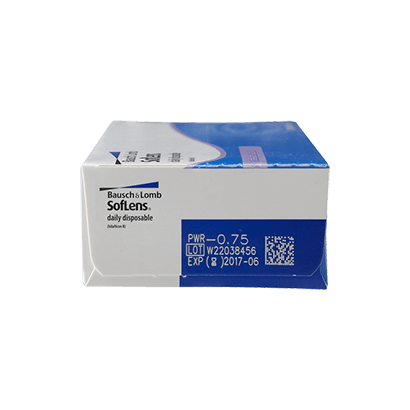 Review Soflens Daily Disposable Great value and they do the job! Will definitely be buying again. Review Soflens Daily Disposable Have been using soflens for years and have always found them incredibly comfortable even when worn for far too long a day. The odd one refuses to go in but only one or two in a three month period. Have tried others and have always come back to these for comfort. Perfect for the price! These contact lenses are excellent value for money, however they are a little difficult to get in sometimes as I often find they fold up on my finger, but once they are in I can see perfectly. I sometimes find when I've been wearing them for a long day, they make my eye feel a little dry and itchy. really hard to get in your eye These are almost impossible to put in. They're so flexible that they keep flipping backwards over your finger tip. By the time you get them in they are so covered in dust and grit from handling the lenses they have been contaminated and you have to pull them out and start all over. They're okay once they're in, if you have managed to get them in without getting dust on them, but I will never buy them again. Old dependables Easy to fit long lasting one day lens. Sometimes, contact lens wearers need the most convenient solution to their vision problems. SofLens Daily Disposable lenses provide just that and are a superb way to combine excellent visual performance with absolute ease of use. Flexible and able to retain moisture, the Soflens Daily Disposable brand are also high definition lenses that have been engineered to reduce blurring. Affordable and easy to extract from their blister packs, these lenses are perfect for daily lens wearers whose time is limited. The ComfortMoist technology employed by these Bausch and Lomb lenses guarantees to deliver exactly what the name suggests; moisturised eyes and a high level of comfort throughout the day. SofLens Daily Disposable lenses are designed for daily wear and should be discarded after use. 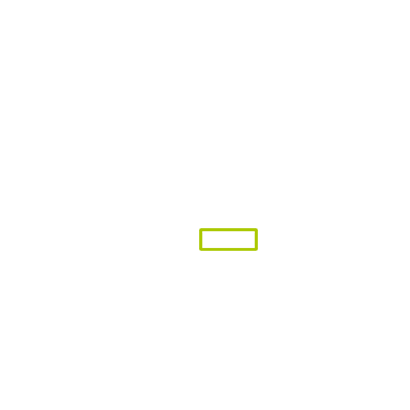 These lenses use an aspherical lens shape, which provides high definition vision and promises to minimize any blurring or distortion which can sometimes result from poorly designed lenses. These lenses are made from a sophisticated blend of water and 41% Hilafilcon B to provide flexibility and moisture. SofLens Daily Disposable lenses are not designed for UV protection. 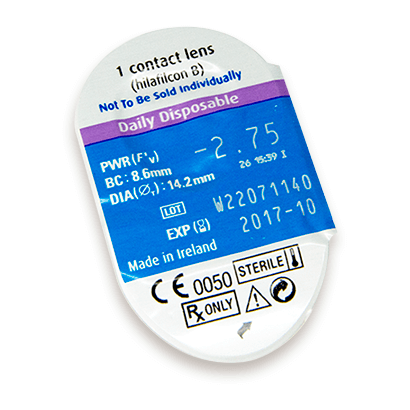 Disposable lenses are ideal for people with busy lifestyles and mild prescriptions. They are generally affordable and require very little care. These lenses are particularly attractive due to their cleverly designed blister packs making them easy to access in the morning.